This stamp from the U.S. Postal Service pays tribute to the majestic emperor penguin (Aptenodytes forsteri). Largest of the penguin species, the emperor stands over three feet tall and can weigh more than 80 pounds. Emperor penguins dive beyond 1,500 feet — deeper than any other bird. 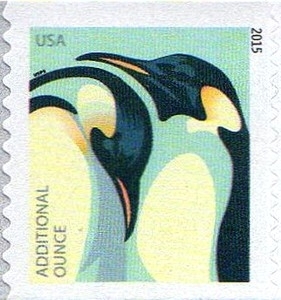 The stamp art is a stylized drawing of a pair of emperor penguins on a cool green background. The pop of orange and yellow on the birds’ beaks and ear patches lends a regal look to the aptly named emperors. Art director Carl Herrman designed the stamp, which was illustrated by Nancy Stahl. The words “ADDITIONAL OUNCE” on this stamp indicate its usage value. Like a Forever® stamp, this stamp will always be valid for the rate printed on it. The initial price and value for this stamp is 22 cents.